Note: This was written the morning before I left for China but refused to post. Here it is! News of my China return soon to follow, now that my Internet has finally been reinstated in my apartment. Yeah! Immerse yourself in Life in China! Visit connieinchina.org. I’m aiming for 10,000 visits to my website by January 12, 2015, which is my 50th birthday. Help me reach that goal by going to connieinchina.org as often as possible. Join me in enjoying an Amity teacher’s life in China. You won’t be disappointed! This last day before heading off to China, I find myself checking my website to see that the newsletter mailing of last week, with the above paragraph, has certainly boosted my readership. Thanks so much for checking in. Your visits are currently at 4,350 with only 5,650 more to go by January 12. Keep it up! But there is a certain dilemma which concerns me, and that has to do with Jenny Bloom. Let me explain. One of my immediate goals for the summer has been putting together my summer newsletter so as not to wait to the last minute before heading back to China. Kelley Ray, my home church office secretary at Marshall First UMC, is my saintly helper in all this. Kelley takes my bare-bones script and turns it into a glorious visual of colors, fancy do-dads, cool formats and neat fonts. She spends hours doing this, often staying past her hours in the church office, to make it pretty and impressive. Without her, my newsletter would be a dull, no-frills affair or may never get done at all. 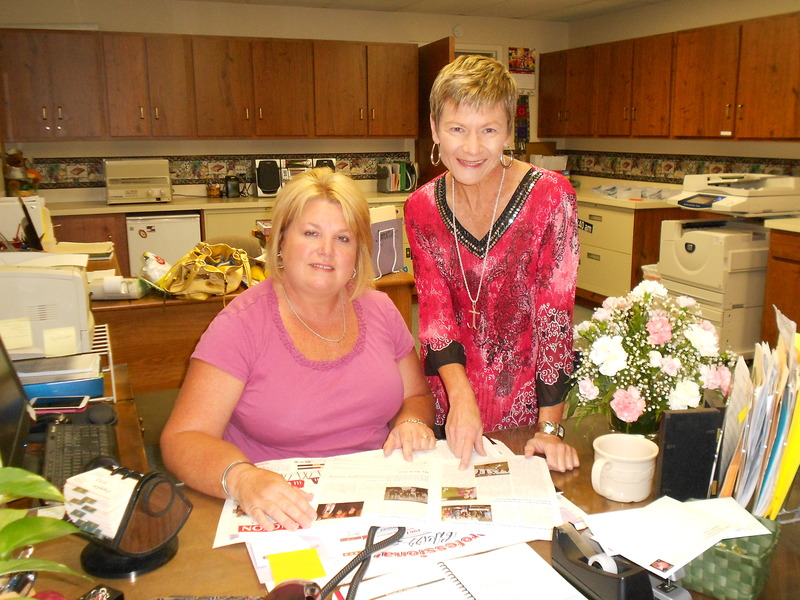 Kelley Ray (seated) and me going over the last touches of my summer newsletter in the church office. My mom is then in charge of proofreading for errors I miss or sentences that cause confusion. After that, Kelley makes adjustments, runs the newsletter pages off and I take over feeding envelopes through the machine to put on the NGO postage (3 hours worth of work), folding papers and stuffing envelopes (6 hours) and sealing (3 hours) before walking them over to the post office for mailing. The newsletter is always growing and now comprises 780 addresses. These are in Kelley’s hands, in a Connie Wieck newsletter list document which continues to get longer every year. When I sent those out last week, I sighed with great relief after dropping them off in 2 big boxes at our local post office. Within 24 hours of mailing those out, what lands in the Wieck mailbox at 503 North Michigan Avenue but a newsletter to Jenny Bloom . . . addressed to my home. Oh, dear! However did that happen?! Well, it’s coming here because the address is addressed as her being here. Jenny is definitely on the newsletter list but for some reason, her address has been entered as my parents’ address. Most likely, I have made a mistake of some sort and poor Jenny is stuck, residentially imprisoned not only on the Connie Wieck Newsletter list in the computer, but imprisoned in our home as well. For the past 7 days, it has been somewhat of an on-going discussion topic about our home’s stowaway, Jenny Bloom, who has been desinated as living in the attic upstairs. We’ve even gotten to the point of including her in household happenings. Smell of burnt anything coming from the kitchen? While all in great fun, there is a concerned part of me that wonders where Jenny Bloom truly is. Is she waiting anxiously a newsletter? Did I meet her on my most recent travels, her name and address written on a scrap of paper that wound up with me accidentally putting my home address on it? Will she be wondering if she’s been forgotten? So here is my plea at present: Jenny Bloom, where are you? If you are reading this, or if anyone knows of “our” Jenny Bloom at any of your churches or UMW units, please send me an email note. I’ll make sure to change that address immediately. Poor thing is probably getting a little tired of living up there in our attic. It’s certainly not the most comfortable part of the house, let me tell you! This entry was posted in 2014 Summer Itineration, A Visit Home to America, Return to China, Smalltown American Life, Travel, Visit To The States. Bookmark the permalink.